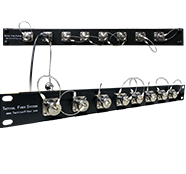 8 input TFS Magnum™ Hybrid Patch Panel with 8 Magnum Hybrid chassis connectors. 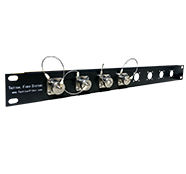 Each Magnum hybrid chassis connector has an LC patch cable and power cable for connection to LC socket and power connector on one TFS Shotgun base unit with SMPTE power. 500' TFS Magnum armored SMPTE hybrid tactical fiber cable reel. 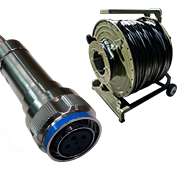 Features TFS DuraTAC armored cable with machined stainless steel connectors.